This lovely, lakeside cottage is a true wonder to behold, with its contemporary design incorporating inventive, luxurious and sustainable elements to create a simple, sophisticated aesthetic. The product of Germany's Bau-Fritz Architects, the home is situated close to a serene expanse of crystal water and bordered by lush, green woodlands, presenting the perfect locale for a summer getaway. From the outset the cottage exudes a delightful design, with the light tones of timber, white concrete and glass characterising its facade, crown by a tiled roof which hosts an array of solar panels. Moving inside and we are embraced by understated, elegant decor, with the kitchen and dining areas dressed in contemporary finishes and furnishings and positioned to look out upon the beautiful lakeside view. The master bedroom of the home rests in casual luxury, bordered by both an expansive, open-plan bathroom including private sauna and a large, private deck, providing another vantage from which to admire the lake and woodlands. Finally, a loft has been included, housing not only a casual living space, but also two novel bunk beds, which have been specially constructed to optimise privacy and comfort. The ingenious design of the cottage provides plenty of food for thought, managing to combine impressive elements of stylish, modern living within a sophisticated, relaxed and inviting construction. Take a tour below and gain some inspiration for your own home! The exterior of the cottage presents a stunning design, incorporating a range of materials to construct a stylish, bi-level home surrounded by beautiful greenery and the serenity of a lakeside view. Pale, timber slats lay an inviting foundation, while a white, concrete wall frames an area for outdoor living. Timber has also been used to construct the upper level of the home, with vast swathes of glass windows and doors included to allow sunshine and air to stream inside. 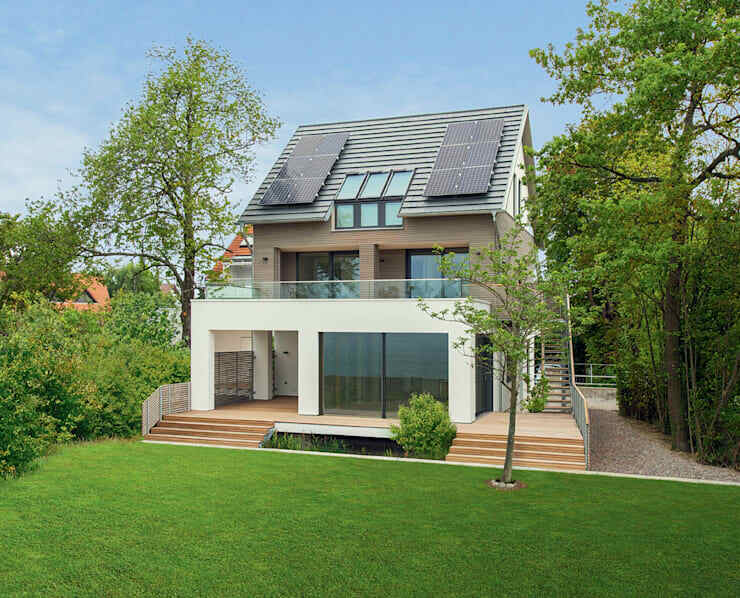 On the roof rests an array of solar panels, demonstrating that this design is not only stylish and contemporary, but seeks to respect its natural surrounds by incorporating sustainable living practices. 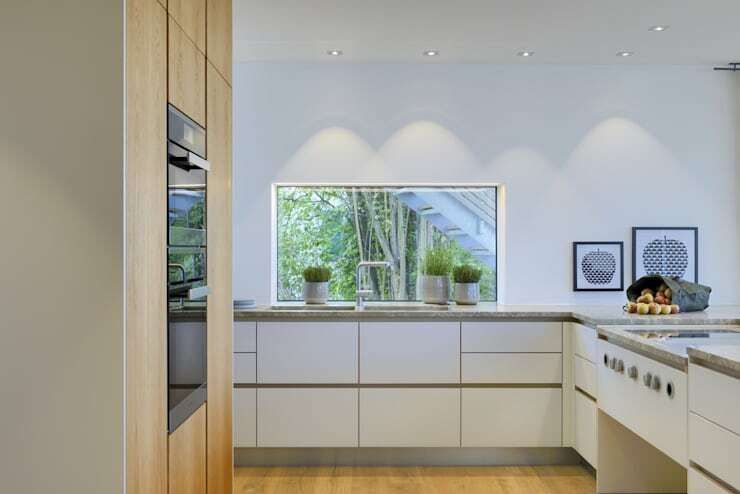 Inside the home we are presented with this streamlined, modern kitchen, with the smooth lines of its wood, white and marble finishes combining to create a sophisticated space. The appliances throughout are stylish and state-of-the-art, while the marble bench tops elevate the kitchen with an infusion of luxury. Light fills the room, flowing through a large window and bouncing about the white walls, and a smattering of potted herbs decorate the window sill, paying homage to their more mature counterparts beyond the glass pane. 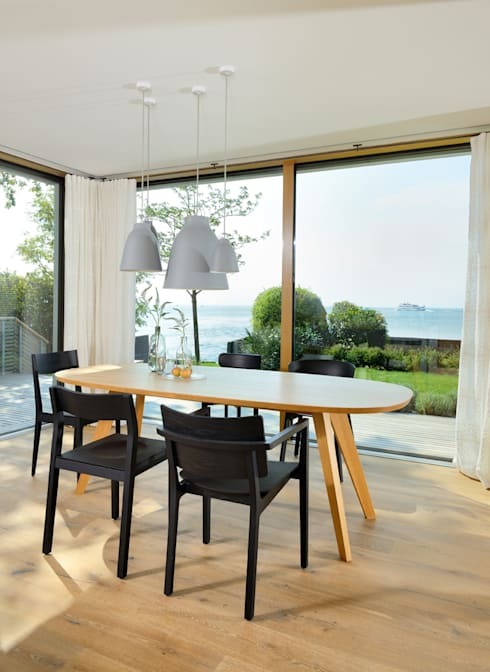 Bordering the kitchen is this minimalistic dining space, with its simple setting looking out onto a gorgeous lakeside view. The long, oval dining table appears chic and modern, and contrasts beautifully with the black, wooden chairs skirting its lengthy curves. 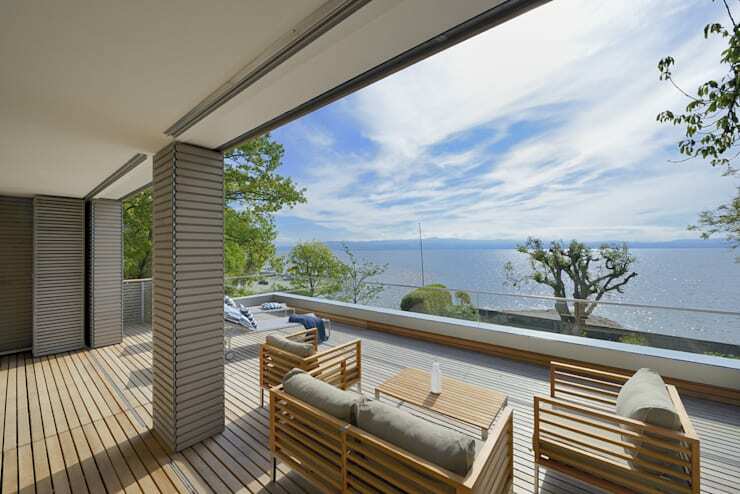 The space is enclosed by a generous stretch of glass sliding doors, allowing this area of the home to easily integrate with the deck beyond, and inviting sunlight and air to circulate during the warmer months. Central within the home sits this novel space, with its white walls and flowing, wooden floorboards constructing a simple and elegant courtyard. 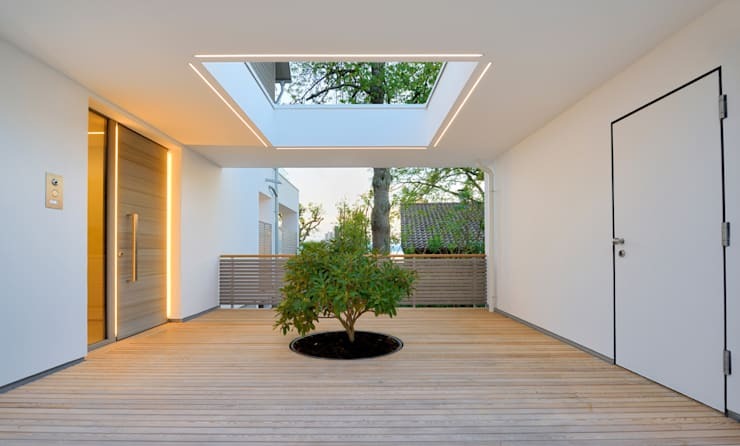 A solitary tree flourishes beneath a large skylight, drawing focus within the courtyard with its understated humility, while a large, wooden door with opulent, brass handle invites entry into the home beyond. The master bedroom is both casual and luxurious, with its subdued colour scheme and timber furnishings relaxing the space, while a private balcony and stunning view of the lake add a sense of stylish exclusivity. A large, cobalt and grey tapestry of a labyrinth complements the paler, blue and grey hues of the bed linen, while twin silver lamps border the bed, with their chic, contemporary design providing the occupants with localised illumination. The view from the master bedroom is simply stunning, with an expansive, wooden deck streaming out from the room and providing a generous area from which to admire the warm, serene blues and greens of the lake and surrounding woodlands. A stylish, contemporary outdoor setting made of timber provides a vantage for relaxation and casual entertainment, while twin sun lounges invite the occupants to soak up some rays. Adding to the sense of luxury within the master bedroom is this open-plan bathroom, replete with private sauna, which borders the space. A contemporary bathtub rests in pristine white, strategically positioned to capitalise on the view beyond the balcony, while the timber finish of the sauna and sheen of a large shower and sink unit can be seen in the distance. 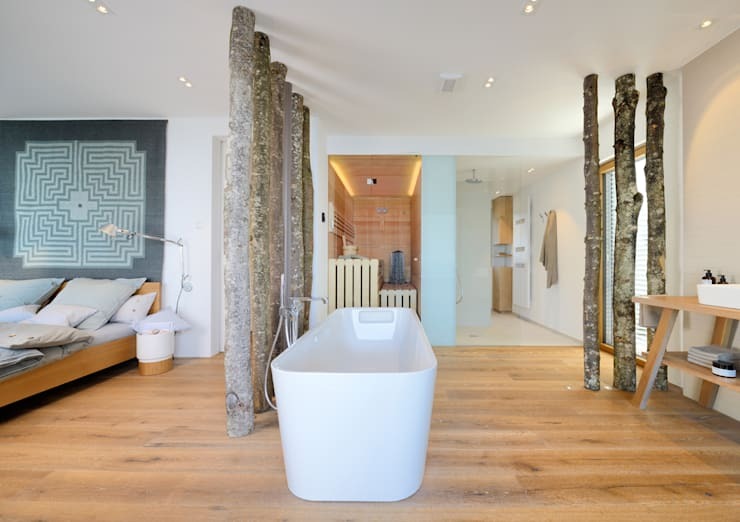 An array of untreated logs frame the bathtub, providing a novel decorative element, reminiscent of the home's woodland environs. 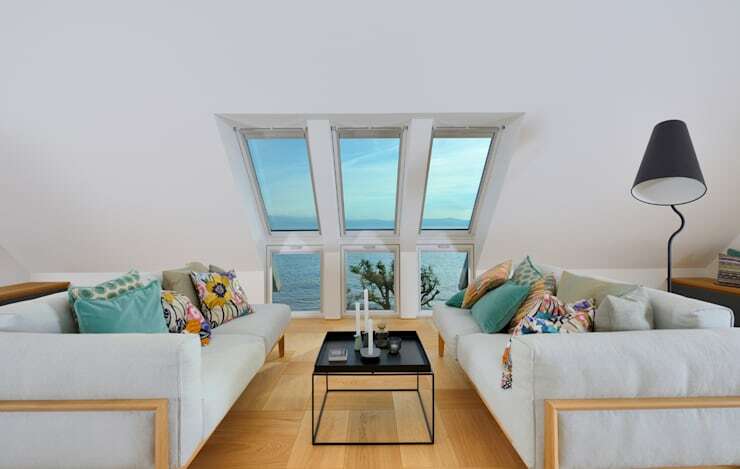 Moving up into the loft area of the home and we are presented with this wonderfully relaxed living area, with its two modern couches providing a comfortable vantage from which to admire the lakeside view through an array of retractable windows. The pale tone of the couches combines with the loft's white walls to sooth the space, while an abundance of colourful cushions add hints of vibrant colour. This living area presents the perfect locale to relax and recline, or entertain guests and visitors in casual privacy. The loft also includes these brilliantly designed bunk beds, in which two timber cubby holes each host a double mattress. The design is stylish and contemporary, with the bunks having been impressively constructed from smooth timber, producing two cosy, private spaces to host guests or visiting children. Lamps have been included to illuminate the interior of the bunk units, with sliding doors in contrasting grey closing each off after dark. Were you inspired by the sustainable element included in this home? If so, have a look at these tips to Create your own holistic garden. Which is your favourite space within this lovely, contemporary cottage? Tell us your thoughts below!